A whole new level of innovation and supreme quality in a CPAP Pillow Mask, the ResMed AirFit™ P10 offers all the advanced features of the ResMed Swift™ FX queue of masks. It provides comfort and simplicity in a lightweight and elegant design. You will notice the quiet operation as soon as the mask is placed on the user and therapy begins. The introduction of innovative woven-mesh QuietAir™ vent has made the ResMed AirFit™ P10 the quietest mask of its kind. Available on Amazon for just 70$, it is one of the most cost efficient masks compared to its fellow competitors. The mask is characterized by its small size and light weight design. 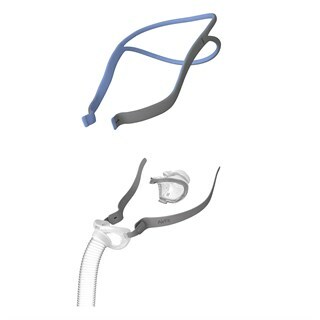 The AirFit™ P10 is comprised of three parts; headgear, QuietAir™ vent frame and nasal pillow. The pillow can be very easily added or separated from the whole using top and bottom clips. You can also remove the headgear for complete disassembly. 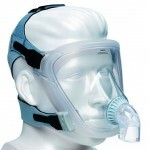 The ResMed AirFit™ P10 is one of the quietest masks ever made. 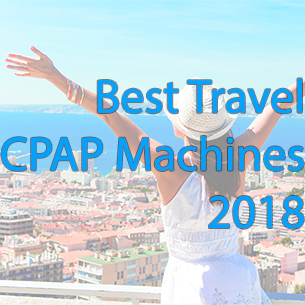 It brings you the latest technology in sleep apnea therapy. The AirFit P10 is approximately 50% lighter and 50% quieter than its ancestors and it allows you to have more than 40 minutes of additional sleep per night. It slips easily into place, is incredibly comfortable to wear, and the headgear keeps the device stable. The QuietAir™ woven-mesh venting effectively directs the air away from you and your partner, so that it doesn’t cause any discomfort. Offering additional comfort and ease of use without compromising stability, the device also offers a distinctive split-strap headgear design for minimal facial contact to give you a real sense of freedom. The AirFit™ P10 so comfortable that, it has won the Red Dot Award for excellent design. 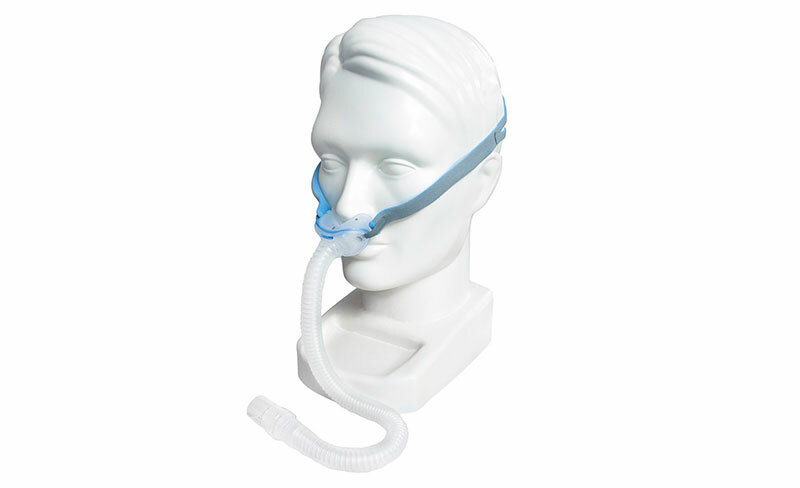 The nasal pillow mask will work with any CPAP or BiPAP machine. 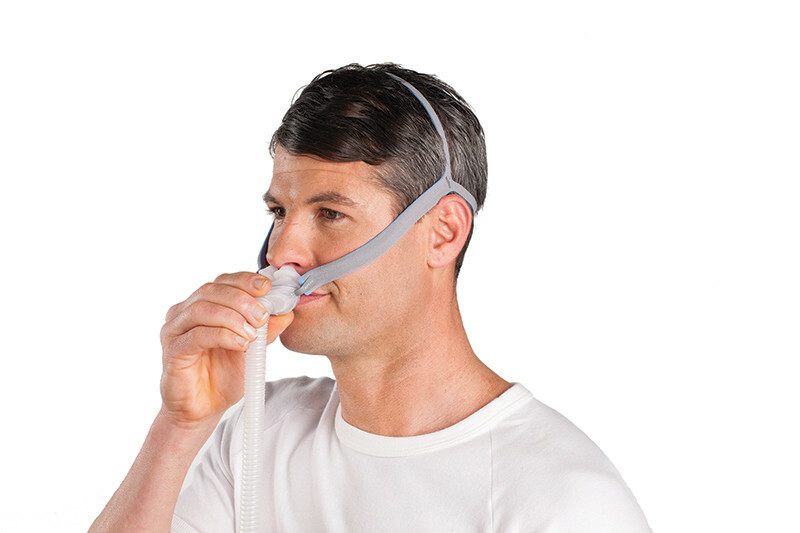 The AirFit can easily connect to any CPAP Tube without needing any special adapters. Like every electronic device the ResMed AirFit™ P10 has a few shortcomings. Some of the users have complained about the lack of a swivel in the hose attachment at the front end of the machine. Therefore, movement is hindered a bit. The mask may pull and leak while turning in bed due to lack of flexibility. The plastic pillows that actually sit in your nostrils are more firmly held compared to the other models. This may give you more support, but it may also forcefully direct the pillows into your nostrils, leaving you with a sore nose in the morning. Despite a few problems, the AirFit™ P10 is one of the best nasal pillow masks available in the market right now. It will give you very good value for your money. The AirFit P10 model brings you some nice modifications which includes the front air diffuser and stretchy headgear. If you are in the market for a nasal pillow mask that will give you great features within a low budget, then the ResMed AirFit™ P10 is a very good option. I can’t believe I got this so cheap especially since it had very good reviews. The mask is small and light and is quite comfortable compared to my last one which was a real hassle to wear. This is one of the best nasal pillow masks on the market and it should be more expensive imho.